Here we go at last! This is the last chapter of the story Two Dates. Are you curious what will happen to Alan, Martha and Bruce. I hope that the ending of the story will surprise you at least a bit and that you will like it. So, what are you waiting for? Start with the mind map and revive what happened in the previous parts of the story Two Dates. Then translate the vocabulary on the vocabulary branch. This time some of the words are pretty challenging. And once you know the new words start the story video. In the end answer the comprehension questions in the mind map and discuss your opinions with a partner. Good luck and enjoy the story. 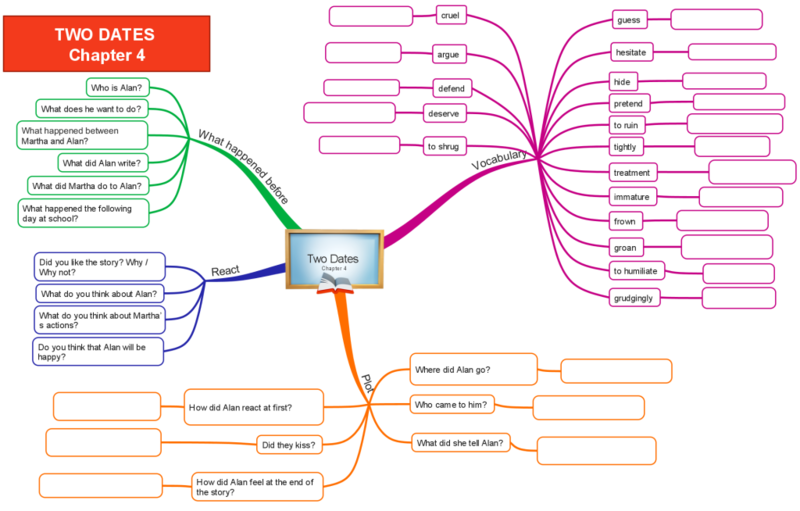 Here is the mind map which serves as a worksheet. Complete first the What happened and Vocabulary sections. Now that you know the ending of the story it is time to concentrate on the language. There are two games here to practise the new words. The first one is a Hot Spot quiz and your task is to click on the word whose definition you can see at the top of the page. As the game is in HTML5 it should be viewable on all devices. Enjoy and I hope you will score 100%. If you are using a mobile phone or an iPad you might be interested in another HTML5 game, you can go to Two Dates Chapter 3 where there is the memory game in HTML5. Alan decided to hide out in the library where it was quiet, and he knew most people would not be able to find him. He knew he was not a bad kid. True, he might not have the best qualities, or he might not be the best student, but he knew he was a pretty nice guy. He loved animals, and he loved helping people out. He did not deserve such a cruel treatment, so why were they so mean to him? The sound of footsteps coming up towards him made Alan look up. Susan stood in front of him, with her arms across her chest. The look on Susan’s face softened. “I did not laugh at you Alan. That was mean of Martha.” She smiled gently at him and asked him if she could sit next to him. Alan grudgingly agreed. He was wary. Susan could pretend to be nice and then humiliate him again in front of the whole class just like Martha had. “No!” Alan protested, and before he could even think, he grabbed Susan’s hand tightly. “I will come with you,” Susan smiled and kissed him lightly on his lips. “See you in the class,” she said and walked away. It was going to be a very different year indeed. Will you permit me to share this on twitter? There should be one that works. Which program do you use for the mind map type diagrams? I have been using a few. First, iMindMap, MapleMind and eDraw. Thanks, your presentations are good. This is a good story thank for writing this whole thing!!!!!!!!!!!!!!!!!!!!!!!!!!!!!!!!!!!!!!!!!!!!!!!!!!!!!!!!!!!! Thanks for this video story. My students really enjoyed it.